Get crafty with a gallery tour featuring artworks that are invigorating, interesting, and inspiring for crafting. Crafters of all media are welcome, and refreshments will be provided after the tour. Be sure to send images of your finished project inspired by this program to webmaster@cartermuseum.org. The submitted images will be displayed on the Carter’s Facebook page. Their flyer is located here. I just got off the phone with Brady, a fellow crafter and the Public Programs Manager at The Amon Carter Museum. She was nice enough to take the time to chat with me about this event series and what the evening will hold for those interested in attending. This will be their 2nd "Crafting from the Collection" event which is FREE and features a tour of 3 or 4 featured works of art. They will provide sketching paper and pencils at the event, or you can bring your own sketch pad and paper. Important to note: Pens are not allowed. After viewing the art and discussion, there will be a crafting demo focused on a featured project, followed by some free time for socializing and refreshments. The demos at these events are taught by several people people to insure project variety. At the last event, they learned how to make some folded fabric flowers. Another important note: Other than the demo, crafting supplies are not allowed in the museum. This sounds like a great opportunity to get out of the house, learn a new craft, meet fellow local crafters, and get inspired! So, go check it out and see what inspires you. Don't forget to send your finished crafty project pictures to webmaster@cartermuseum.org so they can be featured on the Amon Carter Museum's Fan Page! This posting is for TWO shows. They are sponsored by the same group and take place at the same venue, so I am just posting them together. Booth fees range from $150 to $300 for spaces that range from 8X3 to 10X10. Application can be found here and are due by August 1st, 2010. Application can be found here and are due by October 1st, 2010. Carley Seale, owner of The Gypsy Wagon boutique, is excited to announce the return of Gypsy Handmade Markets. Originally launched in Fall 2008 as an outlet for local "do-it-themselvers" to sell their wares, Seale has decided to bring the Saturday shop events back for the spring, and is looking for fresh talent to participate. Press Release and Flyer can be found here. This event will take place outside, in front of the store. The yard will be split up to fix approx 4 artists each Saturday. Booth spaces are approx 12X8 and cost $25. Application has been uploaded here. Simply copy the application and paste it into an email and fill it out. The popular, open-air Grapevine Market makes its seasonal return to Historic Downtown Grapevine on Saturday, April 10, and will be open every Thursday and Saturday from 9 a.m. to 2 p.m. until October 16. You can find an eclectic array of items at Grapevine Market, including the finest handmade jewelry, distinctive home décor, quality antiques, and more. Peruse the unique displays and indulge in something special. The Grapevine Market is a great reoccurring local opportunity to build your client base. As stated above, it happens every Thursday and Saturday with the EXCEPTION of two weekends that are denoted on the calendar. While out at the Cannon Open-Air market, I heard a lot of good things about the Grapevine Market from my fellow vendors. It sounds like it has a pretty good turn out, especially on Saturdays. The Booth Fee is $10 for an 8X8 space. Applications are due no later than 5:00pm on the Monday before Thur/Sat's market to be considered for that week. Once your application is approved, it applies for the entire 2010 season. Here are some of the exciting events going on in your local arts and crafts community! Admission: Adults $5.00, Kids 12 and under are free! The Curious Cake Shoppe will be set up at the 1st Annual Open-Air Market in Grapevine. If you're coming out, stop by and say hello! Good luck to all those vendors setting up this weekend! I hope you have beautiful weather, good sales, and, most importantly, lots of fun! We are inviting East Dallas Artists to participate in the 2nd annual LakewoodStock Festival on May 16, 2010 from 12- – 8 p.m. The Festival is geared to promote local Lakewood merchants as well as celebrate amazing artists, craftsmen, and performers living in East Dallas. The LakewoodStock Festival offers an opportunity to market to and reach many East Dallas residents in just one day. The casual atmosphere will allow for people to feel free to talk with the artists and get to know more about you and your art. There is a 10% discount to Lakewood Business Association Members. Tables and tents are available at an additional cost. There is a security deposit for $100.00 which will be returned after the show if space and equipment is left in good standing. Our Craft Show Calendar has been living on Facebook for the last few days, but it has decided to take a summer home at Blogger. You can find it lounging about with all sorts of Craft Show and Application Dates by looking to the toolbar on the left and clicking DFWCraftShows Calendar. Don't worry, it will still be on Facebook all the time... even if it doesn't want to admit it! They have sold out of 4X8 spaces. All booths include a 6' by 18" table and chair. Applications are still being accepted and can be found here. Booth fees are due at time of application. Proceeds will benefit the Indianettes. They are still, as of today, accepting applications. The pre-registration date has passed, so the booth fee is now $85 for an approx 10 X 6 space. Two chairs are provided. Booth fee is $110 for an approx 10X6 space. Two chairs are provided. Deadline is May 1, 2010. We just received confirmation on the Funky Finds Fall Event! It's Funky Finds, so you know it's going to be fantastic. I will post more information as it becomes available, so stay tuned! 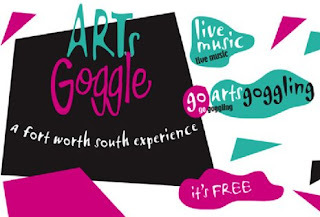 ArtsGoggle is a celebration of the arts, begun in 2003, and sponsored by Fort Worth South, Inc., the organization whose mission is the revitalization of Fort Worth’s Near Southside. This is our seventh year, and participation continues to grow (over 65 venues, over 200 artists, and 13 bands last fall) as more people discover this unique and eclectic neighborhood event. This free to the public, family-friendly event attracts a crowd as diverse as the neighborhood itself with live music, artistic displays of every kind, food, drink, and fun for everyone. Public support has increased rapidly, as evidenced by ArtsGoggle’s selection as the Best Gallery Art Show of the Last 12 Months by Fort Worth Weekly readers in 2007 and 2008. If you are an Artist and wish to exhibit your art there is no charge & what you sell is all yours to keep. The outdoor arts & craft fair will be held in conjunction with the popular Little Motor City Antique Car Show!! Bounce castle for kids. Live music beginning around 5:30pm. Stick around after the Arts Fest for a fish fry at the Tabernacle and 42 Tournament at Signor's on the Strip! Deadline is has been moved to June 1st. Contact Marisa Edmonson at sewmanymemories@windstream.net or at 903-674-2365. Event brought to you by Detroit-based businesses Sew Many Memories and Newsom Photography, FunkyFinds.com, Country Home Care & Clarksville Nursing Center. Etsy Fort Worth has announced their 1st Annual Cowtown Indie Bazaar! Over 90 artisans, designers, and crafters will showcase how innovation and craftsmanship combine to create unique, modern, handmade goods. Find fashion forward clothing and jewelry, original artwork, stylish decor for the home, upcycled and repurposed vintage wares, and more. This is not your Granny's craft show! The event will be full of free family-friendly fun with live music, raffle prizes given throughout the day, and 50 FREE goody bags filled handmade treasures. The Cowtown Indie Bazaar is brought to you by Etsy Fort Worth but is open for any vendor to apply. Booth fees range from $55 for a 5X10 space up to $85 for a 10X10. Corner and Double booths are available at an additional cost. Booth fees are due at the time of application, along with a $10 application fee. Vendors who are not accepted for the show will receive a refund in the amount of their booth fee. Applications are due by June 30th, but it says the sooner you apply the best spot you will be reserved if accepted. All accepted artists will receive an acceptance email the week of July 5th. The Curious Cake Shoppe application is en route! Holler and let us know if you hope to be there too! The Friends of the Bedford Library is hosting a their 1st Annual Bazaar! They do not have an event website, so I am hosting their information here. You are allowed to split a space with another vendor, but they are not selling spaces less than this size. No electricity or water is available. Payments will be accepted as cash or check only, by snail mail. Include a self addressed envelope for confirmation card. Mailing address and show map are available within application. If you're reading this, then I suppose you've found our little corner of the internet. Since this is the first post of my blog, coinciding with the first day of our Facebook page, I might as well introduce myself. My name is Tania and I own a small side business called The Curious Cake Shoppe. I've been having a blast working away at all the handmade goods that we sell since 2005. I only recently started attending local craft shows, and I immediately realized how much time and effort it takes to simply stay on top of all the many Arts & Crafts Shows that are going on around us constantly. There are ample opportunities in North Texas to showcase and sell our handmade goods, but finding them can be extremely difficult and exhausting! It's all about constantly searching the internet, local organizations, and networking. So I figured, why not start our own network on one of the largest networking sites online (Facebook) and share our individual show knowledge to build one giant Arts & Craft show database! And that's why I'm here. I created this blog and Facebook Page as a networking tool between artists, crafters, and shoppers who are looking for local show information. I don't know all the shows going on in North Texas, and I bet you don't either. But together, maybe we know about twice as many as we did before. And the more the network grows, the more that number grows. I want to create a community where we can share our information and help insure that every artist, crafter, and shopper is aware of all the opportunities to sell and shop local! Not to mention the fact that we will be giving that much more attention to those small shows that are struggling to get off the ground. If we can make them great, they will be back year after year, and those opportunities will continue to grow. So, become a fan! Message me your shows! I will gather up the information and: post them here, add them to our universal calendar, link to them on our Facebook page, and continue to distribute the info as best I can! The navigation bar is located across the top of the website. You have have noticed it change a few times in the past couple of months, and it is changing again. I have now included a section for our Weekend Guides, as well as a section for our upcoming articles. Pretty straight forward, but a powerful tool not to be over looked. The search box is located towards the top of the left sidebar. Here you can enter keywords to find particular shows. I mainly use this feature myself to find information on specific shows I remember posting, or giveaways from specific vendors etc..
Love the site but always forget to check in? You can subscribe to our posts through this RSS feed. Now, every time something new is listed on DFW Craft Shows, you will receive an email about it. This is the closest thing to a newsletter that we currently have. An alternative way to keep up to day on blog posts is to "follow" or "like" our Twitter and/or Facebook pages. Whenever we have new show information, it will be posted here as well. We also remind our FB / Twitter followers of impending application deadlines, current giveaways, and more! Just a quick mention of our Submit Show page, which allows you to submit any show information that you may have into our system for publication on DFW Craft Shows. This is the fastest way to get a show listed here, but there may still be a delay as each show submission is reviewed and manually entered on the website to insure relevance. This is a great tool to browse our posts by labels. Each show post is categorized by location, month, and type, which you can view at the bottom of the post right before the comments. These labels are clickable here, or can be accessed on the left sidebar. This is a great way to look at show listings by location, but it is also a great way to filter shows by type. Shows that that are handmade-only are indicated by the "handmade" tag. You can also select a month to see all shows currently listed for that month. 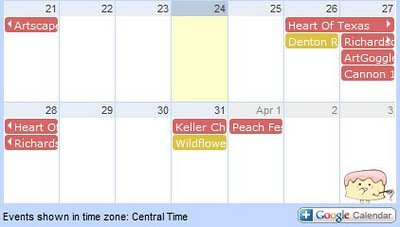 This information is easily viewable on our calendar page as well.